The winemakers in the Paso Robles AVA make a great bottle of wine, and we’ve not written about them much even though it’s a favorite place for us to sample California wine. 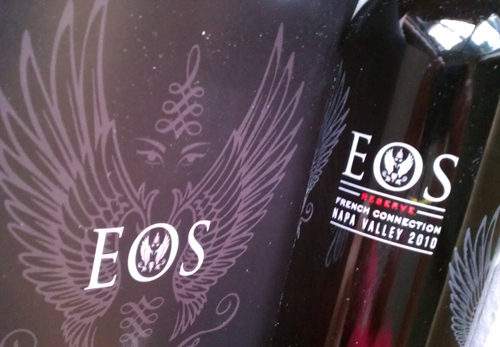 Since it is wine club delivery season, we’ll review one of the wineries in this area, Eos Estates, whose shipment just arrived. Eos is part of the Foley Family of wine, brands like Firestone, Chalk Hill, Clifford Bay, Kuleto Estate, Lincort, Merus, Three Rivers and Vavasour. Eos Estates Winery was formally on the south side of Highway 46 and privately owned, but went bankrupt several years back. Bill Foley immediately jumped on the brand, vanquished the tasting room and rebranded his Firestone Winery across the street as Eos Estate Winery. Foley is famous for describing his acquisition plans in the Wall Street Journal, that he was looking for good wineries run by older winemakers who failed to plan for their retirement. If they had no children to whom they could hand over the keys, he was ready to write a check. The latest iteration of their wine sports what would appear to be wings, similar to what you’d see on the back of a Hell’s Angels jacket, or perhaps their tattoos. But in the world of wine, terrior, tannin & grape, they resemble Eos the Greek Goddess of the Dawn. She’s the sister of Helios, God of the Sun, and also sister to Selene, Goddess of the Moon. So, the wing theme seems to fit the name, the romanticism and mysticism of a good winery. Their wine tasting room sits on the corner of Highway 46 and Airport Road. It’s always been a nice facility and we’ve always enjoyed our visits. They make Sauvignon Blanc, Chardonnay and Muscat Canelli, but being red wine lovers we don’t qualify to rank them, as they don’t match our palates. Their value priced Zins from Paso Robles have always been a favorite of ours. You’ll find their Chardonnay, Zinfandel Port and Moscato at BevMo. Total Wine carries their Petite Sirah and Paso Robles Cabernet. This entry was posted in Cabernet Sauvignon, California Wineries - New World Wines, Chardonnay, Dry Creek Valley, Highway 46 Corridor, Paso Robles AVA, Tasting Room Etiquite, The Pleasures of Tasting Wine, Thoughts About Wine - Exploding Ruby Flowers On Your Palette, Zinfandel and tagged bottle of wine, paso, robles, wine, wineries.